What is another word for fracture? 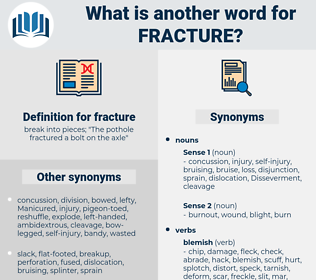 break into pieces; " The pothole fractured a bolt on the axle"
frac-out, fault, break, failure, break-up, split, disruption, breach, crack, tear, divide, burst. rupture, rift, breakup, breakage, division. attach, attend, yield, fasten, mend, mind, join, recondition, comply, solder, defer, unite, reconstruct, rebuild, follow, mark, submit, repair, observe, doctor, heed, serve, renovate, fix, bind, listen, note, heal, watch, secure, weld, obey, conform, patch, regard, notice, surrender.
" It looks like a fracture to me," observed Olive in her precise voice. A breaking cord may fracture your bow. 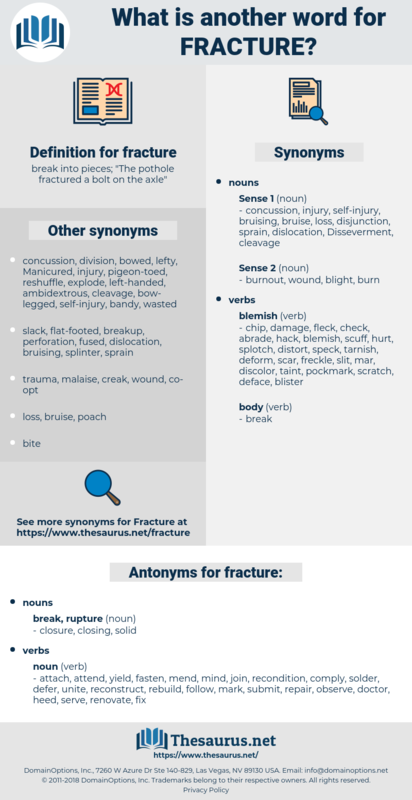 compression fracture, impacted fracture, incomplete fracture, capillary fracture, comminuted fracture, displaced fracture, closed fracture, depressed fracture, open fracture, fatigue fracture, simple fracture, stress fracture, compound fracture, hairline fracture, complete fracture. break off, stop, injure, wound, break, discontinue.